Neurosurgery Hannover Professor Amir Samii, M.D. Medical specialists and specialty clinics in Hannover recommended by senior consultants in Germany can be found in the Leading Medicine Guide. You can find experts in Hannover to treat your illness and you may contact them directly. 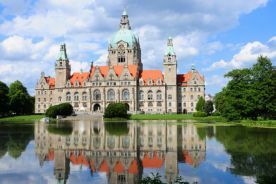 Hannover is the capital of the state of Lower Saxony and with its population of 522,000 the city is ranked 13 on the list of large German cities. Hannover is known all over the world particularly for hosting the Hannover trade fair the world's largest Industrial trade fair since 1947 and CeBIT the world's largest trade fair in computing technology. Besides, Hannover is also a well known centre of trade, industry and services. Hannover also has a lot of Saxon culture to offer thanks to its innumerable theatres, museums and galleries. The most famous landmarks of Hannover include the new town hall, the market church, the Anzeiger Hochhaus and the telecommunications tower Telemax. Hannover has more than 16 hospitals with about 5000 beds. About 180,000 patients receive inpatient treatment every year. The Leading Medicine Guide shows you a selection of doctors and clinics that are ranked among the medical practitioners or specialty clinics in Hannover.